The Bay of Arguin (French: Baie d'Arguin) is a bay on the Atlantic shore of Mauritania. It is located south of Cap Blanc, north of Cap Timiris. The bay contains three islands, including Arguin and Tidra, as well as numerous sandbanks. It is also the site of the 12,000 km² Banc d'Arguin National Park which includes most of the bay. 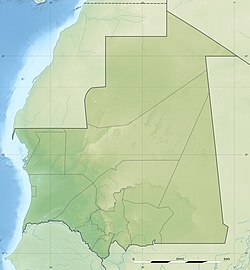 The park's northern boundary is at Minou; it does not include the Dakhlet Nouadhibou, or the westernmost areas. Smaller bays within the Bay of Arguin include Dakhlet Nouadhibou in the north and Baie de Tanoudert in the east. Other promontories include Minou, Cap Sainte-Anne, Argun, Alzaz, Tagarit and Tafarit. The Oued Chibka, a seasonal and occasional stream flowing only when the climate is partly wet, is in the north-central part. Inhabited places by the bay include Nouadhibou in the north, Arkeiss and Tel-Alloul to the east and Teichott , R'Gueiba and Awguei to the south. The bay would be first known in 1035, when Abdallah ibn Yasin founded a ribat (military refuge) on the island of Tidra at the origins of the Almoravid Dynasty. The first European to visit the bay was Nuno Tristão in 1443, whereupon the remainder of the bay would be explored. The area is also known as the place where the French frigate Méduse (1810) was famously wrecked in 1816. ^ "Baie d'Arguin". Mapcarta. Retrieved 14 October 2016. ^ Corréard, Alexandre; Savigny, Jean Baptiste Henri (2004-04-01). Narrative of a Voyage to Senegal in 1816 Undertaken by Order of the French Government, Comprising an Account of the Shipwreck of the Medusa, the Sufferings of the Crew, and the Various Occurrences on Board the Raft, in the Desert of Zaara, at St. Louis, and at the Camp of Daccard. to Which Are Subjoined Observations Respecting the Agriculture of the Western Coast of Africa, from Cape Blanco to the Mouth of the Gambia. This Mauritania location article is a stub. You can help Wikipedia by expanding it. This page was last edited on 12 March 2019, at 12:35 (UTC).